The Civil War is a 1990 American television documentary miniseries created by Ken Burns about the American Civil War. It was first broadcast on PBS on five consecutive nights from September 23 to 28, 1990. More than 39 million viewers tuned in to at least one episode, and viewership averaged more than 14 million viewers each evening, making it the most-watched program ever to air on PBS. It was awarded more than 40 major television and film honors. A companion book to the documentary was released shortly after the series aired. The series was rebroadcast in June 1994 as a lead-up to Baseball, then remastered for its 12th anniversary in 2002, although it remained in standard definition resolution. To commemorate the film's 25th anniversary and the 150th anniversary of Lincoln's assassination, the film underwent a complete digital restoration to high definition format in 2015. This completely restored version aired on PBS September 7–11, 2015. The series' slow zooming and panning across still images was later termed the "Ken Burns effect". Burns combined these images with modern cinematography, music, narration by David McCullough, anecdotes and insights from authors such as Shelby Foote, historians Barbara J. Fields, Ed Bearss, and Stephen B. Oates; and actors reading contemporary quotes from historical figures such as Abraham Lincoln, Robert E. Lee, Ulysses S. Grant, Walt Whitman, Stonewall Jackson, and Frederick Douglass, as well as diaries by Mary Chesnut, Sam Watkins, Elisha Hunt Rhodes and George Templeton Strong. A large cast of actors voiced correspondence, memoirs, news articles, and stood in for historical figures from the Civil War. Burns also interviewed Daisy Turner, then a 104-year-old daughter of an ex-slave, whose poetry features prominently in the series. Turner died in February 1988, a full two and a half years before the series aired. Production ran five years. The film was co-produced by Ken's brother Ric Burns, written by Geoffrey C. Ward and Ric Burns, edited by Paul Barnes with cinematography by Buddy Squires. The theme song of the documentary is the instrumental "Ashokan Farewell", which is heard twenty-five times during the film. The song was composed by Jay Ungar in 1982 and he describes it as "the song coming out of "a sense of loss and longing" after the annual Ashokan Music & Dance Camps ended." It is the only modern piece of music heard in the film, and subsequently became the first ever single release for the Elektra Nonesuch label, which released the series' soundtrack album. It became so closely associated with the series that people frequently and erroneously believe it was a Civil War song. Ungar, his band Fiddle Fever and pianist Jacqueline Schwab performed this song and many of the other 19th century songs used in the film. Schwab's arrangements in particular have been acclaimed by many experts. Musicologist Alexander Klein wrote: "Upon watching the full documentary, one is immediately struck by the lyricism of Schwab's playing and, more importantly, her exceptional arranging skills. What had been originally rousing and at times bellicose songs such as the southern "Bonnie Blue Flag" or the northern "Battle Cry of Freedom" now suddenly sounded like heart-warming, lyrical melodies due to Schwab's interpretations. The pianist not only changed the songs' original mood but also allowed herself some harmonic liberties so as to make these century-old marching tunes into piano lamentations that contemporary audiences could fully identify with". A major piece of vocal music in the series is a version of the old spiritual "We Are Climbing Jacob's Ladder", performed a cappella by the African American singer, scholar and activist Bernice Johnson Reagon and several other female voices. The song appears on Reagon's album River of Life. Each episode was divided into numerous chapters or vignettes, but each generally had a primary theme or focus (i.e., a specific battle or topic). The series followed a fairly consistent chronological order of history. Assassination; Useless, Useless; The Picklocks Of Biographers; Was It Not Real? The series received more than forty major film and television awards, including two Emmy Awards, two Grammy Awards, Producer of the Year Award from the Producers Guild of America, People's Choice Award, Peabody Award, duPont-Columbia Award, D.W. Griffith Award, and the US$50,000 Lincoln Prize, among dozens of others. The series sparked a major renewal of interest in the Civil War. It was widely acclaimed for its skill in depicting and retelling the events of the Civil War, and also for noticeably drawing huge numbers of viewers into a new awareness of the genuine historical importance of this conflict. Prior to this series, the Civil War had been somewhat neglected in popular historical consciousness. After this series, there was a vast new sudden upturn in popular books and other works on the Civil War. Robert Brent Toplin wrote a book in 1996, Ken Burns's The Civil War: Historians Respond, which includes essays both from critical academic historians who felt their topics of interest weren't covered in enough detail in the series as well as responses from Ken Burns and others involved in the series' production. The entire series was digitally remastered for re-release on September 17, 2002 in VHS and DVD by PBS Home Video and Warner Home Video. The DVD release included a short documentary on how a Spirit DataCine was used to transfer and remaster the film. The remastering was limited to producing an improved fullscreen standard definition digital video of the film's interpositive negatives, for broadcast and DVD. The soundtrack was also re-mastered and remixed in 5.1 Dolby Digital AC3 surround sound. Ken Burns and I decided to remaster The Civil War for several reasons. First of all when we completed the film in 1989, we were operating under a very tight schedule and budget. As the main editor on the film, I always wanted to go back and improve the overall quality of the film. The other reason for remastering the film at this time is that the technology to color correct, print and transfer a film to video for broadcast has vastly improved, especially in the realm of digital computer technology... We also were able to eliminate a great deal of the dust and dirt that often get embedded into 16mm film when it is printed. For the 150th anniversary of the end of the War, and the 25th anniversary of the series, PBS remastered the series in high-definition. This work involved creating a new 4K Ultra High Definition digital master of the film's original camera negatives and was carried out in association with the George Eastman House, where the original 16mm negatives are preserved. It aired on PBS September 7–11, 2015. Blu-ray and DVD editions were released on October 13, 2015. 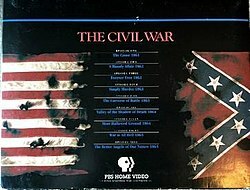 A soundtrack featuring songs from the miniseries, many of which were songs popular during the Civil War, has been released. ^ Ward, Geoffrey C.; Burns, Ric; Burns, Ken (1992) [First published 1991]. The Civil War: An Illustrated History. New York: Knopf. ISBN 978-0679742777. ^ "'The Civil War', 'Gettysburg' capture history". Southern Illonoisan. June 25, 1994. Retrieved June 2, 2018. ^ "'Civil War' audience 'discovers' storyteller-writer Shelby Foote". TV Today. The Milwaukee Sentinel. September 25, 1990. Retrieved 2013-07-01. ^ "The Civil War . The Film . Music of the Civil War". pbs.org. ^ DiMartino, Dave. "Instrumental Soundtracks Chime In." Billboard magazine, 16 February 1991, p. 55. ^ a b "The Civil War . The Film . Episode Descriptions". pbs.org. ^ Alexander Klein, "Scoring Ken Burns' Civil War: An Interview with Pianist Jacqueline Schwab"Film Score Monthly, April 2013. ^ "Sunday Prime Time Television Listings". The Milwaukee Sentinel. September 22, 1990. Retrieved 2013-07-01. ^ a b "Monday Prime Time Television Listings". The Milwaukee Sentinel. September 24, 1990. Retrieved 2013-07-01. ^ a b "Tuesday Prime Time Television Listings". The Milwaukee Sentinel. September 25, 1990. Retrieved 2013-07-01. ^ a b "Wednesday Prime Time Television Listings". The Milwaukee Sentinel. September 26, 1990. Retrieved 2013-07-01. ^ a b "Thursday Prime Time Television Listings". The Milwaukee Sentinel. September 27, 1990. Retrieved 2013-07-01. ^ Thanks a Lot, Ken Burns, by James M. Lundberg, Salon. com, June 7, 2011. ^ "Why we decided to Re-master The Civil War". ^ Patrick Kevin Day (April 9, 2015). "PBS to air remastered version of Ken Burns' 'The Civil War'". The Los Angeles Times. Retrieved 2015-06-02.